When it comes to your overall oral health, no one wants to take care of their mouth using dirty, outdated instruments! Here at Dr. David Scharf’s office we make your health and safety one of our utmost concerns. To ensure that you are getting proper oral care while keeping you safe, happy and healthy, we use the best technology available when sanitizing and caring for our dental instruments. In many other dental offices, tools are often hand washed and sanitized in a two-step process. While this is great, it can be a little difficult for human hands to clean and sanitize dental instruments to the degree that we’d like. At Dr. Scharf’s we’ve completely eliminated the need for hand washing our tools. In our office, we are proud to use a machine called the Miele Dental Disinfector, which essentially acts like a giant sterilizing dishwasher! Not only does the Miele Dental Disinfector completely sanitize any contaminated dental instruments, but it protects our staff from accidental injuries! You can learn more about our sterilization process here! Here at Dr. David Scharf’s office, we make your health and safety one of our utmost concerns. The iCat scanner is an in-office x-ray machine that produces three-dimensional images of the mouth and jaws. This state of the art scanner allows Dr. Scharf to see your jaws without any of the distortion or clarity issues that are found when using a normal imaging device. The iCat scanner produces fantastic images, and at lower levels of radiation! Higher quality images result in better dental care, and can even predict the outcome (to an extent) of certain surgeries. Aside from high quality dental scans, the iCat Scanner eliminates the need to make an outside appointment with a radiologist for a dentascan. It can all be done conveniently in office! Our office was one of the first in the area to offer this revolutionary imaging system, and we are so excited to make it available to all of you! Created by a group of dentists looking to revolutionize gum disease treatment, the Periolase Laser eliminates the need for “cut and stitch” surgery when treating gum disease. The Periolase Laser is used during our LANAP procedure, and works to kill and remove any bacteria found below the gum line. The advanced technology of the laser allows Dr. Scharf to tackle gum disease without damaging any existing, healthy tissue. Our Millennium Laser cauterizes the gum while killing bacteria, resulting in less blood, and a reduced recovery time! This laser treatment isn’t only for those suffering from gum disease, it can be used to treat canker sores or to fix some cosmetic issues. 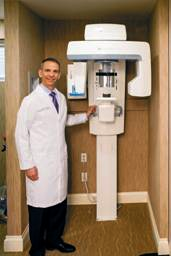 Make an appointment with Dr. Scharf today to see if our Millennium Laser could benefit you! Using paper records can cause a slew of inconveniences for our staff and for our patients. No one has the time to wait around for the delivery of important medical records. Computerized records are more cost effective (plus, it leaves less of an environmental impact! ), convenient, and creates more privacy for each patient. Additionally, computerized records can make for better communication between doctors offices! If you need records transferred, they can get to their destination almost instantly! Patients of Dr. Scharf are now able to access their own dental records 24/7 through our online system! It isn’t a secret that no two patients are alike! This is especially true for patients with gum disease. Instead of a generalized treatment plan for all patients, The PreViser Periodontal Disease Risk and Analyst Software gives Dr. Scharf the ability to create a customized gum disease treatment plan. The PreViser allows patients to see what the expected outcome of their gum disease treatment based on the state of their current dental health. Our software also helps patients who are recovering from gum disease “stay on top” of any other potential periodontal issues, and helps maintain mouth health after gum disease treatment. The Previser software gives each patient a “score” depending on how well their periodontal health is maintained after the conclusion of gum disease treatment. Looking for top-notch care with the best technology around? It’s time to visit our office! Visit our office for dental implants in Long Island, the LANAP procedure, or even a consultation appointment. Dr. Scharf is one of the most experienced, highly trained professionals in the business, and we are passionate about helping you! Call us today!